Move East then West, advance then retreat. When others expect you to act, don't act. When others don't expect you to act, take action. Applying this stratagem to Go: it is a perfect description of a leaning attack. 'Leaning attack' means that you are attacking a group on one side in order to gain enough strength to attack your real target on the other side. 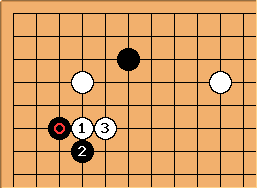 After Black has made a double kakari White "attacks" the marked black stone. Actually, she is not really attacking this stone, as this stone becomes stronger because of the subsequent sequence. The real aim here is to strengthen White's corner, then attacking the lone black stone at the top. See also 4-4 point, double low approach, attach-extend. In leaning attacks generally, the player cannot choose a priori a singular "real aim", because the end result depends on what the opponent chooses. For instance in the position above, one could say that white has ambiguous strategy of engulfing the black stone on the left, pressuring the upper side or even other things of which a singular path will be realized, depending on how black answers locally (or elsewhere). Concerning Sunzi's stratagem, it is about deception, a concept that demands that information is not complete, so the essence of it trivially cannot be applied to Go. I think trick plays would be a more appropriate (if still not satisfactory) reference.